No doubt another reason why Israelis fear Syriza so much. 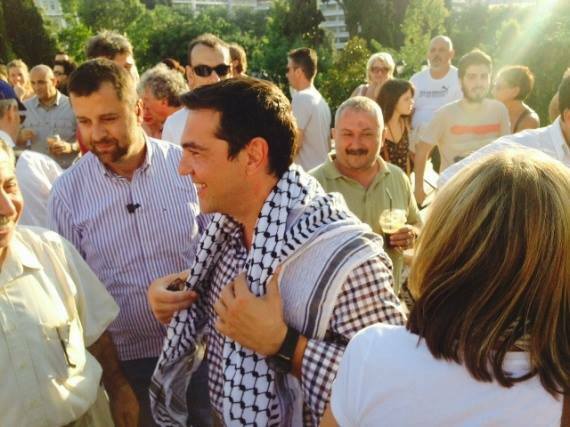 Tsipras has the nerve to wear the fearsome Palestinian scarf that strikes terror in the hearts of every Israeli. Can you imagine the uproar in Israel had he actually done something to help Palestinians? But now that Tsipras’ government is in power, maybe – just maybe – he will. Just as soon as he gets the Greeks out from under the crushing weight of European debt. That is, IF his efforts to save Greece aren’t sabotaged by the international cabal of bankers and their armies, afraid that Greece might set a precedent. In other words, in the off chance that Greeks might be able to help themselves, and potentially help Palestinians thereafter, israelis will do everything in their power to “defend themselves” from the Greek menace. And that is how a paranoid schizophrenic nation operates. This man is living on borrowed time…He had better be wearing his Kevlar undies. funny. but no one lives on borrowed time. All of our days are numbered. The question remains, what will we do with them? zionist jews will be trying to kill him soon but of course it will be blamed on Muslims.